All my reviews in recent times has been about serious books but the upcoming two reviews are going to be different. There’s a love story and the crime thriller coming up in the blog.. so stay tuned all of you. 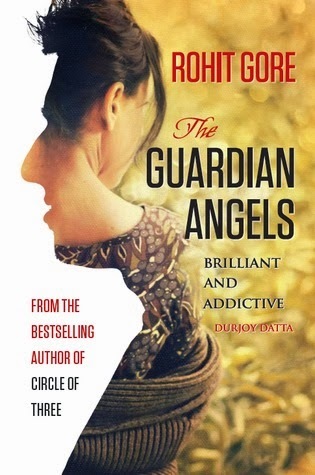 The latest love story I read was “The Guardian Angels” by Indian Author Rohit Gore. Now when you think about love stories you get some ideas in mind on how the story can be. Track 1 – Girl meets boy, fall in love, wants to get married but the girl’s family plays a villain. Track 2 – Boy meets girl, boy falls in love but girl is not approving (for whatever reason) and the boy does daredevil stuffs to win the girl’s love and love happily ever after!!! These tracks come in my mind all thanks to the Bollywood flicks of the 90s! But behold readers “The Guardian Angels” is nothing like that. Let’s find out how the story unfolds. Aditya the rich kid in the school is often roughed up by the tough guys – The TrippleHeads. He is saved one day from this bullying by the charming and witty Radha with her presence of mind, and gradually Radha & Aditya become friends. Later, there are incidents when we find these two protecting each other from any vice coming their way. They develop an unknown liking and are together without telling each other. Both come from opposite backgrounds but still are at absolute peace. Aditya is the son of the rich business tycoon, staying at the plush multistoried property meant for only four people in a posh locality of Mumbai, where as Radha is the simple daughter of a Trade Union leader. He aspires to become a cricketer but then he follows the footsteps of his dad, and she wants to become a social activist and will stand much against the money minting business minded people like Aditya’s family. Their pair looks odd, but they try to stick against odds. If there is something called destiny it’s explained perfectly here. There are few things I absolutely liked, the narration, the characters and the simplicity. The author has not mentioned in the story that Aditya & Radha are a couple or are dating but as you keep reading you understand the feeling and get the depth of their feelings. It’s the perfect title for this novel I feel. As you start reading and go through Aditya’s formative years you get a very uncanny resemblance with our Cricket God, very very close resemblance I must say, though Aditya is supposed to be developing into the next big prodigy after Tendulkar. Again, the industrialist family, their palatial multistoried home is just the Antillia story. Don’t know the rationale behind these, but it’s ok. I particularly liked the parts where you have the characters talking about their day to day lives and the transformations. When he had written to me asking to review this book, he had mentioned a line “I can assure you that THE GUARDIAN ANGELS won’t disappoint you.” and I am so glad that he stuck to it. It really didn’t disappoint me. He is a novelist based in Pune and this is his fourth novel after Circle of Three, Focus Sam and A Darker Dawn. I haven’t read them but I am looking forward to reading them in near future. He is also a management consultant with an IT major. You can read more about him at his site http://www.rohitgore.com/. My Ratings – 4/5. It’s quite a good read, I won’t be surprised if I start reading it again after few months! This book was sent by the author. These are entirely my own views and I try not to be biased while reviewing.